Grew up near San Francisco. In 1997 I got a full scholarship to play football for the University of Hawaii. 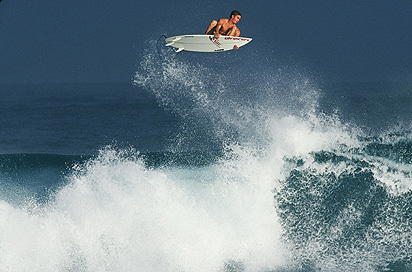 Once football ended I turned in the pads and headed to Indonesia for a two month surf trip. Upon returning I met North Shore photographer, Hank Foto while working as a bouncer in Waikiki. Soon after Hank started showing me the ropes of photography while I assisted him (mostly driving his film into town to be developed.) After helping Hank out I also landed an assisting gig with Brian Bielmann that lasted two years, after that I went full time freelance. Travels have taken me to: Mexico, Canada, Costa Rica, Singapore, Taiwan, Japan, Tahiti, Australia, Curacao, Martinique, Cape Verde, Spain, England, Poland, Sweden, Norway, Iceland, Thailand, Indonesia, and most recently Cambodia. In 2005 I was awarded photo of the year at SURFER magazine for a shot of Shane Dorian at Teahupoo. I've been published in a variety of surf magazines around the world such as: SURFER, Transworld, WATER, ASL, Tracks, Surf Europe, FLOW, Surfing World and more. I mostly split my time between Hawaii and California when I'm not traveling.